Throughout 2018, we have been challenging bands to a game of 'Title Fight'. The rules are pretty simple - we put 60 seconds on the clock and they have to name as many of their own songs as they can before the time runs out. We've seen some extremely competitive displays over the last 12 months but now the time has come to crown the ultimate 'Title Fight' champion of 2018. So, who managed to name the most songs in 1 minute? Let's count down the scores! Cracking the 30 barrier as we enter the top 5, Matt wasn't confident going into this one, but he smashed it in the end. What's even better than beating your bandmate? Beating your bandmate who is also your brother. Pretty damn impressive that after only two albums, Awsten remembered more than a lot of acts who have been around way longer. Plus, he took it all SUPER SERIOUSLY which was extra unexpected! Congratulations Patty - you have a memory like no other rock star we have met this year! This one will take some beating. 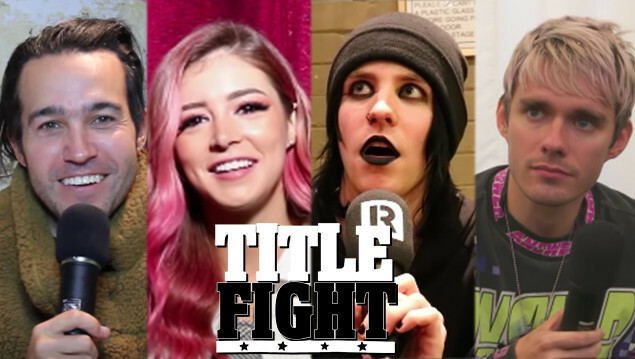 So, who do you want to see take on 'Title Fight' next? Let us know!